Construct a LEGO® brick model of one of the world’s best-known national monuments with this LEGO Architecture 21042 The Statue of Liberty set. Located in New York City harbor, the Statue of Liberty stands more than 305 feet above Liberty Island, welcoming seafarers from around the globe. An icon of freedom, the statue was presented as a gift to the people of the United States from the people of France, and was officially dedicated in front of huge crowds on October 28, 1886. This detailed model captures the structure’s harmonious blend of architecture and sculpture, and features an intricately detailed pedestal with shield <(>&<)> brick detailing and columned balconies, while the beautifully crafted Lady Liberty statue features a flowing robe, broken shackles, 7-ray crown, iconic tablet and an upraised arm bearing a golden torch. This elegant LEGO Architecture model comes with an authentic sand-green and beige color scheme, finished with a decorative nameplate. Price is 41% below the initial Lego retail price, a € 45.04 discount! This comes down to 3.85 cent per brick. 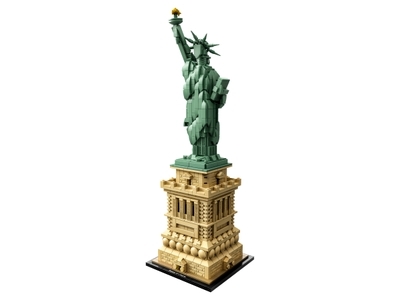 The Statue of Liberty (21042) Lego set is available from the sites below. However, they do not offer delivery to your selected region. The Statue of Liberty (21042) Lego set is no longer directly available from the sites below. However, 3rd party partners of these sites might still have the set available. Alternate description Create an iconic symbol of freedom—the Statue of Liberty!